PORTLAND, Ore. ― It was late morning in an artsy cafe, the smell of coffee and baked goods sweetening the air, and Ashley Bishop sat at a table, recalling a time when she was taught that most of secular American society was worthy of contempt. Growing up in private evangelical Christian schools, Bishop saw the world in extremes, good and evil, heaven and hell. She was taught that to dance was to sin, that gay people were child molesters and that mental illness was a function of satanic influence. Teachers at her schools talked about slavery as black immigration, and instructors called environmentalists "hippie witches." Bishop's family moved around a lot when she was a child, but her family always enrolled her in evangelical schools. So when Bishop left school in 2003 and entered the real world at 17, she felt like she was an alien landing on Planet Earth for the first time. Having been cut off from mainstream society, she felt unequipped to handle the job market and develop secular friendships. Lacking shared cultural and historical references, she spent most of her 20s holed up in her bedroom, suffering from crippling social anxiety. Now, at 31, she has become everything that she was once taught to hate. She shares an apartment with her girlfriend of two years. She sees a therapist and takes medication for depression, a condition born, in part, of her stifling education. Years later, some of the schools Bishop attended are largely the same, but some have changed in a significant way: Unlike when Bishop was a student, parents are not the only ones paying tuition for these fundamentalist religious schools – so are taxpayers. These schools are among thousands in the United States that participate in private school choice programs, which most often come in the form of state-level voucher or tax credit scholarships. Voucher programs offer publicly funded financial aid to parents for private schools. Tax credit programs usually offer individuals or corporations tax credits if they donate to a scholarship granting organization, which in turn offers private school scholarships based on various criteria, including income. President Donald Trump and Education Secretary Betsy DeVos have openly championed such programs and have encouraged states to embrace school choice, arguing that voucher programs give parents an alternative to low-performing public schools. Currently 14 states and the District of Columbia have voucher programs, and 17 have tax credit programs. DeVos has made it a top priority to push a federal school choice initiative. Many of the private schools that participate in these state-led programs are run by evangelical Christian churches. They are sometimes unaccredited and can teach a curriculum similar to the one Bishop studied ― all with the help of taxpayer dollars. The textbooks used at all of Bishop's schools were published by three of the most popular, and most ideologically extreme, Christian textbook companies: Abeka, Bob Jones University Press and Accelerated Christian Education. The ideas in these textbooks often flout widely accepted science and historical fact. But the number of schools using these resources is largely unknown, even in states where they receive support from publicly funded scholarships. No state or federal organization tracks the curriculum being used in private school choice programs. The religious affiliations of schools that participate in these programs are also not always tracked. That means there are thousands of kids receiving an extremist and ultraconservative education at the expense of taxpayers. Several months ago, HuffPost set out to create a database of every private school in the country that receives taxpayer funding. We also tracked the religious affiliation of each school and looked at how many taught from these evangelical Christian textbooks. HuffPost obtained lists of schools that participate in private school choice programs around the country. We searched for the most up-to-date lists on either a state's education or revenue department's website. Several states did not keep a list of which schools participate in choice programs. In those instances, we went directly to the individual scholarship granting organizations in each state. Then we researched the religious affiliations of each school by scouring each school's website. If a school did not maintain a website, we emailed school representatives and often followed up with a phone call. Our analysis found that about 75 percent of voucher schools across the country are religious ― usually Christian or Catholic, with about 2 percent identifying as Jewish and 1 percent identifying as Muslim. There were gray areas: At least six schools identified as non-religious but used a curriculum created by the founder of the Church of Scientology, L. Ron Hubbard. Since a plurality of schools in these programs (42 percent) are non-Catholic Christian schools, we dove deeply into researching the curriculum of those schools. We searched their websites for information on curriculum sources and sent out emails to school leaders if they did not make their academic plan public. We did not assess Catholic schools, which made up 29 percent of Christian schools, since there is already a large body of research on the outcomes of students who go to these schools. Evangelical Christian schools are newer ― many popped up only a few decades ago – and remain less scrutinized. Indeed, we found many of the non-Catholic Christian schools (32 percent) were using Abeka, Bob Jones or ACE textbooks in at least one subject or grade. We found that Abeka was the most popular textbook source ― used in about 27 percent of non-Catholic Christian schools ― and Accelerated Christian Education was the least popular ― used in about 5 percent of these schools. We could not definitively ascertain the curriculum used by about 2,000 Christian schools, because they did not respond to requests for information. Around 200 Christian schools told us they did not use these three textbook sources. With taxpayers footing the bill for religious private schools, the separation of church and state, a cornerstone of American democracy, becomes a murky line. So how did it come to be that taxpayers are footing the bill for an evangelical education? Additionally, private schools that participate in these programs are not typically subject to the same accountability and transparency rules as public schools, although rules vary on a state-by-state basis. It is difficult to ascertain exactly how many students use taxpayer funds to attend schools with evangelical curricula, but we do know that over 400,000 students nationwide currently attend school using money from a voucher or tax credit program, according to the education reform group EdChoice. Some states are more transparent than others. In Indiana, about 4,240 students received over $16 million in scholarships to attend schools that use the Abeka or Bob Jones curriculum, according to 2016-2017 figures from the Indiana Department of Education. These numbers could soon grow. DeVos is an advocate of school choice and religious education. 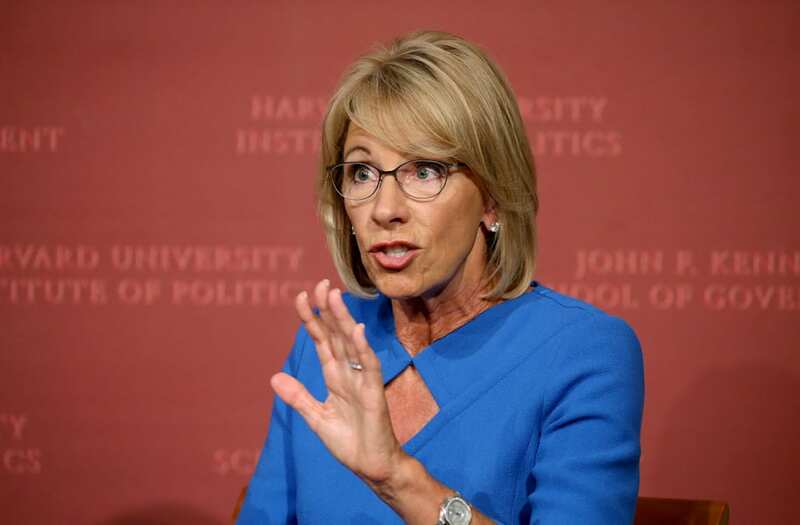 While she failed in her first attempt to push a federal private school choice program via the Education Department budget, she has repeatedly said she will not stop trying. The prospect of giving kids more access to these schools with public money is deeply upsetting to Bishop, who was recently diagnosed with post-traumatic stress disorder as a result of bullying and corporal punishment she experienced as a child. After leaving high school and getting a taste of the outside world, Bishop fell into a deep depression. When she went to job interviews, she had no idea what to say about the education she had received. HuffPost spoke to nearly a dozen former students and teachers at schools that relied on Abeka, Bob Jones and Accelerated Christian Education curricula. Many of these students, who consider themselves no longer religious, reported feeling traumatized by their educational experiences. A number of them communicate with each other via online support groups for survivors of fundamentalist schools, including Bishop. Some say these curriculum sources left them woefully ill-equipped to thrive in a diverse society while instilling in them racist, sexist and intolerant views of the world. Bishop said her fundamentalist education made her wary of people from other religious groups whom her teachers and textbooks had demonized. "Anything that wasn't Christianity was a strange religion," said Bishop, who made it a priority to study other religious practices after high school and even spent time with the Hare Krishna. "But even other denominations were evil. Catholicism especially." Another former student who spoke to HuffPost under the pseudonym Natasha Balzak, was taught at home that all Muslims hate America, she said. Teachers at her Florida school reinforced this idea, telling students to pray for Muslims and other non-believers, like atheists and gay people. "When it comes to hateful ideology and rhetoric, I was taught a lot of things to skew my mind into believing ― I guess you could call it brainwashing," said Balzak, 27, who is using a pseudonym to protect the identity of family members who are still deeply involved in their church. Balzak recalled that her school, Coral Springs Christian Academy, used a mix of ACE and Abeka materials, but the head of the school said they were not aware of the school ever using ACE and that they currently used only Abeka in lower grades for phonics. The school participates in Florida's three private-school choice programs and currently enrolls 172 students on these scholarships. It received $554,418 in taxpayer-funded scholarships this year, according to a spokesperson for the Florida Department of Education. A HuffPost analysis of Abeka, Bob Jones and ACE textbooks confirms the recollections of these students. These materials inaccurately portray events in Muslim and Catholic history while perpetuating anti-Semitic stereotypes. The materials speak disparagingly of Native Americans and Native culture. The chart below details some of the inaccurate and biased perspectives in these textbooks compared with the perspective of an academic who studies these issues. See all the schools we could confirm use one of these curriculums in our full dataset. A Bob Jones high school world history textbook portrays Islam as a violent religion and contains a title "Islam and Murder." In the same textbook, when describing the Catholic Reformation, Catholic leaders are described as failing "to see that the root of their problems was doctrinal error." When describing the concept of Manifest Destiny, the term used to describe America's 19th century expansion westward, an ACE textbook referred to the movement essentially as spreading the gospel: "It was considered God's will that this vastly superior American culture should spread to all corners of the North American continent," the passage reads. "The benighted Indians would be among the many beneficiaries of God's provision." David Brockman, an expert on world religions, was presented with passages from the Bob Jones and ACE textbooks. Most Protestants would likely disagree with the theological and historical narratives portrayed in the books, he said. "The textbook simply distorts history," wrote Brockman, a non-resident scholar at Rice University's Baker Institute for Public Policy, after examining the selections. "And given the biblical command not to bear false witness, I would question whether a distorted history is consistent with Christian teaching." When Balzak attended a secular college in 2009, it was a shock to the system, she said. In her first environmental science class, she learned about climate change ― a concept she had been taught was a hoax. "When I took my first real science class, a million light bulbs went off," said Balzak, who had only been taught creationism in school. "Everything finally made sense." The experience made Balzak feel robbed of a fact-based education. Indeed, Balzak's former school, Coral Springs Christian Academy, includes a statement of faith in its parent-student handbook, which is posted on its website: "We believe God created the entire universe out of nothing." The handbook also describes the school's attitude toward LGBTQ students. It says administrators will reject applicants or expel current students if they are caught "living in, or condoning, or supporting any form of sexual immorality; practicing or promoting a homosexual lifestyle or alternative gender identity." "It's a very different education I'm sure than 20 year ago," said head of school Joseph Sanelli. But in some ways, Balzak considered herself lucky. She said her childhood wasn't traumatic, just deeply imperfect. Bishop didn't have such luck. Some of the schools Bishop attended were worse than others. She faced the greatest difficulty from ages 11 to 13, when she attended Franklin Christian Academy in Georgia. The school appears to no longer be open, according to the Georgia Department of Education list of private schools, and a series of calls to what Bishop said was an affiliated church were not returned. The school consisted of three rooms, Bishop recalled, with most of the school's 30-something kids spending all day in the same classroom. The school relied on an Accelerated Christian Education curriculum currently used by at least nine private schools in Georgia that are eligible for taxpayer funds. ACE classrooms are uniquely designed. Students sit in cubicle-like offices, with barriers separating their desks. Teachers do not lead students in lessons or discussions. Instead, students spend all day silently sifting through a succession of readings and fill-in-the-blank worksheets. When students have a question, they raise either an American or Christian flag to get the attention of a class supervisor. A 2012 training manual for administrators obtained by HuffPost lists an education degree as a "detriment" for the job. Indeed these supervisors' lack of qualifications was once the topic of a "Judge Judy" episode about a decade ago. At Bishop's school, she dealt with intense physical bullying and verbal harassment. When she would complain about the harassment, school authorities told her to ignore it. They sometimes implied she was at fault and needed to get closer to Jesus, she said. The school did not employ professionals trained to deal with mental health issues, she added. As a teenager she went nearly mute and thought about killing herself. "I didn't want to get out of bed. I did self-harm," she said, speaking slowly and deliberately over coffee. "I just hated myself and I didn't know what to do about it." It was also around that time that Bishop realized she was attracted to other girls. She repressed her feelings for decades, even spending most of her 20s married to a man. An examination of ACE textbooks shows that its materials push strict ideas about gender roles and sexuality. Even now Bishop still sometimes finds herself shrinking in the presence of men, saying that it's almost like "muscle memory." Balzak echoes these sentiments, saying that even her female teachers reinforced the idea that women are secondary to men. When describing the 1920s, a high school ACE textbook criticizes women for wearing short skirts and cutting their hair, calling it a violation of Scripture. Before the 1920s, when women were less likely to work outside the home, they "were comfortable to be discreet, chaste, keepers at house, good, obedient to their own husbands," says the material. School, Bishop said, made her want to give up on education. She spent some time being home-schooled, then at another Georgia school before moving to Roxboro Christian School in North Carolina. After less than two years there ― in which she spent much of her time hiding in the bathroom ― she dropped out and got her GED. Roxboro currently participates in North Carolina's voucher program, and representatives there confirmed that Bishop was once enrolled. The school also confirmed that they use Abeka, Bob Jones and ACE. Roxboro has received over $8,000 this year in voucher program and currently enrolls four scholarship recipients, per a report from the North Carolina State Education Assistance Authority. Two other schools Bishop attended are also eligible to receive monetary assistance via school voucher or tax credit programs. Bishop attended Beaufort Christian School in South Carolina and Neuse Christian Academy in North Carolina as a child. Beaufort Christian Academy uses materials from Abeka and ACE, per its website. A representative from the school confirmed that Bishop was once enrolled. Neuse Christian Academy uses materials from Abeka and Bob Jones University, and it received $37,368 in scholarship money for 18 students, per the North Carolina Education Assistance Authority. The school was not able to confirm Bishop's enrollment because it does not still have its records from that time. How Did These Textbooks Come To Be? Abeka, Bob Jones University Press and Accelerated Christian Education started selling textbooks in the early 1970s, a few decades before Wisconsin enacted the nation's first voucher program. At the time, enrollment in fundamentalist Christian schools was booming. For one, recent Supreme Court decisions had banned school Bible readings and official school prayer. Groups of evangelical Protestants were alarmed. The founders of these textbook companies dedicated their lives to pushing fundamentalist viewpoints. Abeka leaders Arlin and Beka Horton also founded Pensacola Christian College in Florida, which outlaws dancing and other "satanic practices." They also founded Pensacola Christian Academy, a K-12 school that currently receives public funding for student scholarships via Florida's tax credit program. Bob Jones University Press is affiliated with Bob Jones University, which famously lost its tax-exempt status in 1983 after banning interracial dating, a policy it didn't reverse until 2000. Accelerated Christian Education was founded by Donald Howard, a Texas pastor. In his 1988 book, "World Awakening," Howard describes AIDS as a plague sent down by God intended to punish gay people and other idol worshippers, like "feminists, prochoice, and Planned Parenthood advocates." ACE, Abeka and Bob Jones University Press leaders have largely similar educational philosophies, with a few subtle differences. The leaders of all three companies subscribe to an authoritarian vision of education in which students are taught not to question their elders. While ACE's curriculum barely involves a teacher, Abeka's promotes the educator as an absolute authority, per research from Binghamton University professor Adam Laats. They all have come under fire for providing children with an inadequate education. Eleven separate reviews of the ACE program by experts and academics have repudiated the curriculum, according to research conducted by Jonny Scaramanga at University College London. A representative of ACE responded to one of these reviews from 1987. "Our material is not written with conventional viewpoints in mind. We do not believe that education should be nondirective or speculative, or that the final interpretation of facts and events should be left up to immature inexperienced minds as mainline secular curricula do," wrote a former ACE vice president at the time. The University of California system refuses to accept certain high school courses that rely on BJU and Abeka materials for credit. The Association of Christian Schools International sued the University of California System over this issue in 2005. A judge eventually ruled in favor of the UC System. Still, American taxpayers continue to indirectly prop up these curricula through voucher programs. It is unclear how the proliferation of private school choice programs has affected the bottom line for these textbook companies. Representatives of Bob Jones University Press did not respond to multiple requests for comment. Representatives of ACE did not respond to requests for comment either, however its website claims they are in 6,000 schools around the globe, although a number of experts told HuffPost that they are skeptical of this number. A spokesperson for Abeka noted that, while the company is aware its materials are used in private schools that receive public funding, "Abeka does not advocate or encourage the use of state or federal funding for private, Christian schools." "We recognize that academic scholars have differing opinions on historical/scientific content and that this frequently occurs in both public and private educational institutions as reported in the media. We are confident that our content is accurate, age appropriate, and academically rigorous," wrote Brent Phillips, assistant to the president for business affairs, via email. Educators who use or are familiar with these resources told HuffPost that not all schools who use them have a fundamentalist approach. Indeed, not all schools who use these curricula are deeply religious, and they are used in a range of Christian schools. They emphasize that the quality of these publishers' resources differ based on subject and grade level. Bishop said that, while her "education did not equip me to get the most basic of jobs," she praised the rigor of Abeka and Bob Jones vocabulary and reading comprehension lessons. Dave Moore, executive director of Pittsburgh Urban Christian School in Pennsylvania, said that he does not use any materials provided by these sources but that "Abeka has excellent elementary grammar resources." Pittsburgh Urban Christian receives scholarship money through Pennsylvania's school tax credit program. "I would still use it if we didn't already develop our own curriculum. It does such a good job of it," said Moore of Abeka's elementary phonics and math resources. If his school decided to use Abeka materials, he would direct teachers to be on alert for propaganda, he said. "We do the same thing with secular textbooks," Moore said. Some educators told HuffPost they are happy with the education students receive with these resources. Stephen Lindahl, assistant director of Calumet Christian School in Griffith, Indiana, disagreed with characterizations of Abeka and Bob Jones University Press as pushing a far-right worldview. His school uses Abeka materials almost exclusively for elementary school and then a mix of Abeka and Bob Jones in some later grades. "Abeka and Bob Jones and other biblically based curriculum try to approach academics from a biblical standpoint and from a moral, ethical view, which does not necessarily push any agenda outside of an understanding of God and who Christ is," Lindahl said. He noted that secular textbooks, too, often come with a specific point of view. HuffPost also reached out to multiple national school-choice advocacy groups for their responses on our findings. None of them responded, even sometimes with weeks' notice. However, professors who have studied the curricula say they are dangerous tools for schools to wield. "I want parents to know their children might be coming home with a book that looks like an ordinary textbook but the messages are not what people would ordinarily learn," said Kathleen Wellman, a professor of history at Southern Methodist University who is working on a book about these publications. "Many universities don't require history education, so for many Americans this will be their last exposure to history. And many students say they didn't realize at the time how thoroughly indoctrinated they were being." Sometimes Bishop wonders what her life would have been like had she not attended evangelical schools. She tried taking online university courses once but dropped out after having trouble balancing academics with her job. She still thinks about trying college again from time to time but worries about the financial feasibility. Growing up, her schools had never offered outlets for her interest in art or dance ― things that she maybe would have wanted to explore. The only thing she ever remembers wanting to do was perform, a far cry from her current job, working in the produce department of a grocery store. The only career paths presented to her revolved around the church. "It would be kind of different if I was at a school that allowed me to head in a direction I wanted to go," said Bishop, who lights up when talking about the dance classes she has taken as an adult. "I didn't really get that chance." Kaeli Subberwal contributed to this report. This is the first piece in a HuffPost investigation on the policies and curriculum of schools that participate in private school choice programs.